By EDWARD A. MARTIN, F.G.S. IN April last I had the honour of reading a paper before the Research Committee on the subject of Dew-ponds.' The present paper is to be regarded as a continua­tion of that paper, and although the summer and autumn of 1909 were not conducive to a successful study of the subject, I think that perhaps sufficient new material has accrued to justify a further contribution on the subject, and to draw deductions therefrom. In resuming my observations on the Sussex Downs early last summer, my first duty was to repair my experimental pond. During the late autumn of 1908 it had filled rapidly, and with the heavy falls of snow which occurred during the winter, which was artificially piled around the edge in accordance with Clutterbuck's suggestion, the result was satisfactory, in that the pond became practically full, although not with dew. With the break up of the frost, the pond showed signs of serious leakage. This may possibly have had its origin in the disintegrating power of frost, the damage as usual appearing when the thaw set in, or it may have been owing to the fact that a deep hole showed itself in the clay bottom where a thick stick had almost if not quite pierced it. Visiting the pond in December when the temperature of the air was several degrees below freez­ing-point, nearly thc whole of the water was a mass of ice, and it was quite easy to realize that the sharp edges of the thickening ice may have found a weak spot in the bottom and caused a leakagc. Taking a lesson from the "pinching" of an arctic vessel when caught in the ice, it should be noted that it is well to construct the sides of a pond with very gradually sloping banks, so that the ice, instead of piercing the banks, will be lifted as expansion takes place. I took opportunities during the winter to visit the various ponds referred to in my former paper under arctic conditions, and found that their margins were well adapted to this end. I may remark that a journey over the Downs in mid-winter at night-time, with only the stars to guide one, with the thermometer considerably below freezing-point, and an icy blast blowing from the north-east was an experience to remember. The Downs in such circumstances would no doubt serve as an excellent training-ground for antarctic explorers. * Research Department, April 21, 1910.
f See the Geographical Journal for August, 1909. There was a great shortness of rainfall in February, 1909 (0.20), at Clayton Mills (584 feet), and the pond completely dried up, with much desiccation of the bed. Subsequent rains showed the centre as holding water; and on June 5, when I again commenced to reside there, the water-surface was about 4 feet across and about 6 inches deep. The bottom and edges I then smoothed down until they were as smooth as glass, and there seemed a prospect of the pond filling, but in a few days I found, on returning home one evening, that a flock of sheep, having trampled down the fence, had drunk the greater part of the water, and had made many holes in the clay with their pointed cloven fore hoofs. Again we trampled and smoothed the clay out, and then to encourage the dew, or arrest the rain should that come first, we laid an artificial roof of faggots over the pond, on the principle of the Neolithic hut-dwelling. I must confess that it did not have much effect in either direction, but perhaps the experiment was not continued long enough. I should mention that on one occasion on which I placed in position some faggots, supported over the pond, I covered them with a waterproof sheet 6 feet square. On the following morning (June 12) I found considerably more dew on the under side of the sheet than on the outside. Here there was rising dew moistening the sheet, and this had probably its origin from evaporation of the pond itself. On the follow­ing morning, however, there was dew only on the upper side of the sheet. There was no rain from June 10 to June 21 inclusive, at the end of which timc the pond was dry, and large cracks had appeared at the sides. A storm on June 24 and following night gave 4 inches of water in the pond, and with the swelling of the clay the cracks disappeared. I have referred more particularly to rainfall as affect­ing the pond, as this was the more noticeable in its effects. Hitherto there had been but little dew, and the only fog on the Downs (June 17) had been instru­mental in preserving the clay in a damp condition. On July 1 I determined to excavate the pond to a greater depth, and to make some alterations in the bed of the pond. We first removed the chalk puddle, keeping that for future use, and next the clay puddle and basement of planks and straw. The clay was moist all the way through, although when thrown up on the bank it became in a day or two as hard as brick. The moistness of the clay seemed to show that there may have been some slight percolation through the bottom. Next the planks on which the clay rested were removed. These had retained their colour well, and were not decayed. They were moist on the upper side on which the clay rested, and beneath to a slighter extent where they rested on the straw. The straw and the wood-wool, though much crushed, were but slightly moist, but well preserved. In laying down the new foundations, the planks were laid down immediately on the chalk. On these were laid straw to a much greater thickness than formerly, and on the straw was laid a fresh supply of well-puddled clay. The clay resting on the straw, a greater thickness of clay was necessary, as, of course, the straw yielded to each mass of puddled clay as it was put down, and the clay was made to overlap like tiles on a house. It was no easy task to make such a bottom water­tight, but it was necessary that it should be done in order to test the truth or other­wise of modern theory. The dew-pond was finished on July 13. This was followed by a few dry and hot days, when artificial watering had to be resorted to to prevent cracking of the clay. However, by July 20 there had accumulated sufficient water to enable useful observations to be taken. The dewy night of July 19 (the first for a long time) madc no measurable alteration in the depth of the pond ; and this was so on many subsequent occasions. Repeatedly, when there had been heavy dews on the grass, I looked to see if there had been any rise in the pond, but without finding it. Not only so, but the dry puddled bank showed no signs of dampness. In the 24 hours ended July 28 (7 a.m.) 1.21 inches of rain fell. A rain-gauge in the water of the pond received 1.41 inches. A rain-gauge at Ditchling (below the hills) measured 0.88 inch only. In the case of heavy rains, my gauge on the hill generally exceeded that in the valley. In the case of light rains, more water is usually measured in the valley than on the hill. The result of the rain was to considerably increase the water-surface of the pond, the depth in the centre being 44 inches. The nights since my arrival on the downs on June 6 had been very free from dew. On the night of August 4 there was a heavy deposit of dew, the fourth night of this kind since the date mentioned. Dew immediately appeared on the thermometers which were put out at 10 p.m. There was no rain from July 31 to August 15 inclusive, and the water almost disappeared. On the morning of August 11 there was a thick fog everywhere, but it had not moistened the clay puddle above the pond, and this remained quite hard. This was the first good downland fog for two months. What it did do was to prevent evaporation. On the morning of August 12 there was an inch of water left in the pond. The grass was wringing wet with dew at 7 a.m., but there was none on the hard dry puddle. * The Fahrenheit scale has been used throughout. The wet puddle around the edge seemed to be more wet than usual, which may have been due to capillarity. The pond and mill had no fog around them, but seen from Hassocks station below the hill, 2 miles away, the mills were invisible, being hidden by a valley fog. The dry, sunny, and dewy weather brokc up on August 16, up to which date the observations on pp. 445, 446 were made. It seemed advisable, in order to ascertain the variations of temperature and to test the theory of dew-deposition in a pond, to take hourly temperatures for 24 hours in a selected dew-pond, and at various positions around it. I selected Upper Standean pond (No. 17) for the purpose. This pond is a chalk-puddle one, and contained very clean water. It is situated .at a height of 560 feet, and was 160 feet around the water's edge, with a margin, partly grass-grown, measuring 16 feet from the water's edge to the top of the bank. The experiment commenced at 7.30 a.m. on August 14, a hot sunny day. During the night following, a clear star-lit night, there was a heavy dew, and the circumstances were all that could be desired for the purpose. Fourteen thermometers were placed out in the positions shown in the sketch. The table on p. 447 shows the results. 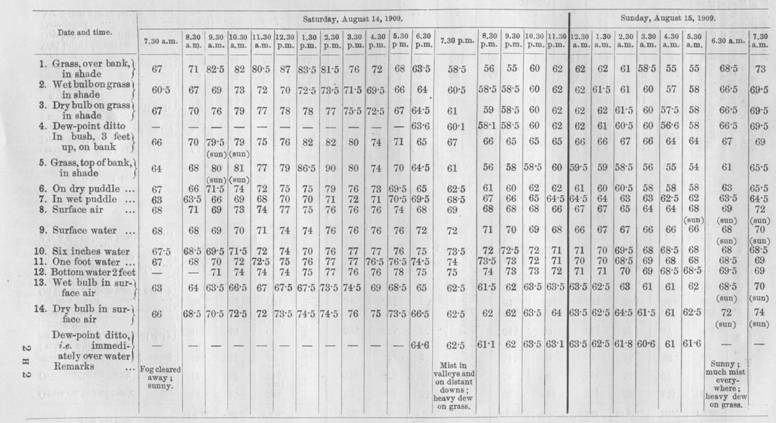 An examination of this table shows that, during the hours of possible dewfall the temperature of the surface air was, with but one exception (12.30 a.m.), always lower than that of the surface water, and that on no occasion did that of the water approach dew-point. During the same hours the dry puddle was always colder than the wet puddle. The dew-point over the water was always higher than that over the grass ; and the surface air was never below dew-point. A stick marked with inches and half-inches was sunk in the middle of the pond, and the depth shown was 1 foot 8½ inches. On September 5 this had increased to 1 foot 91 inches., The pond is drawn on largely for sheep and cattle. In one morning three flocks of sheep, numbering three hundred each, and cows to the number of twenty visited the pond. With the break-up of the fine weather on August 16 dewy nights ceased. The whole of the rainfall for August, 2.95 inches, occurred from that date. So far as the experimental pond was concerned, the rainfall of August 17 (0.43 inch) saved it from complete desiccation, and with 0.78 inch on August 19 and 20 experiments with it were again possible. By August 24 there was a depth of 8 inches in the pond, and with 0.76 inch on August 24 the pond was now 10 inches deep. Watching it in a heavy rain, it was observable how that the impermeable clay caused the water to race down runnels which it made into the pond. Resuming observations in and around this pond, the results are shown in the tables on pp. 448, 449. It must not be supposed that all the water which falls on the bank of a chalk-puddle pond runs down into the pond. Although many ponds have enormous margins, these are proved by testing to soak up almost all of the moderate rains, except that which falls a foot or two above the actual edge of the pond. But this must be modified in the case of one or two ponds, notably that at Ditchling Beacon (No. 5), and concreted ponds when the cracks are kept in a state of repair, such as that on Stanmer Down (No. 30). In heavy rains, however, the area available for drainage is undoubtedly much larger, and in such times when there are artificial runnels emptying through the bank itself, these undoubtedly feed the ponds enormously. Heavy rains quickly saturate the puddle. There is a winding lane leading off the down at Clayton to the farm-pond below. 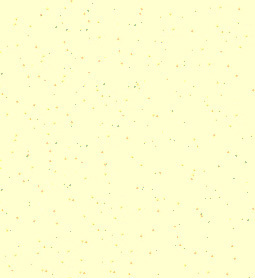 The lower portion is over chalk-marl, the impure chalk at the base of the Lower Chalk. In ordinary rains the water quickly soaks through. The rain of August 23 and 24 was persistent, and the percolating power of the chalk marl had almost ceased. Miniature rivers then ran down the lane, and finally made their exit in the pond. The pond is clay puddled, but in consequence of the unusual entrance of numerous small chalky streams into one corner of it, the green water showed their tracks through it in the shape of sinuous white courses, preliminary to thc sinking of the finely divided chalk to the bottom. This ceased with a marked diminution of the rainfall. If dew is deposited on a pond, it might be possible to ascertain the amount of accession of such water by floating suitable receptacles on the pond. In order to satisfy myself that such would be a true test, it was necessary first of all to ascertain if the temperature in a confined receptacle would differ from that of the surrounding water. I therefore placed thermometers in water in the positions shown in the diagram. The results are tabulated below. They satisfactorily showed that the temperatures were with slight exception identical. The unusually rapid fall of the temperature of the water was due to escape of heat from sides of the receptacle ; the result would have been different had receptacle been sunk in the earth It will be observed that Nos. III. and V. were practically identical. On the evening of August 26 I placed a small shallow glass receptacle so that it floated on the water of the experimental pond, and in this I placed a measured quantity of water. The night was a very dewy one, but in the morning exactly the same quantity of water remained. The grass around the pond was drenched with dew. In the raingauge 0'003 inch was measured. There had been no rain or fog. As will be seen from the table, the dew-point at the surface of the water was well below the air-temperature. Similarly, no accession of water took place on the night of August 27-28, although again there was a heavy dew on the downs. The minimum reached on the grass was 43°. On the night of August 31—September 1, a measured quantity of water was reduced during the night by two-hundredths, the night being clear and cold, and the minimum on the grass being 374°. Further experiments of a similar nature were constantly interfered with by the untoward nature of weather ; indeed, throughout the summer useful work was frequently at a standstill from the same cause. On this night also opal-scale thermometers were placed on the grass, the dry puddle, and the wet puddle. On the first there was dew deposition on both upper and under surfaces of the opal, but in the case of the last two the dew appeared only on the under surfaces. In the case of that on the dry puddle, this shows that the dew was formed by the rise of vapour from the puddle itself, and thus, so far from puddled clay causing dew to be drawn out of the atmosphere, it actually parted with its own moisture without in any way feeding the pond. The puddle itself had not become moist. On the night of September 1, the same opal-scale on the dry puddle received dew on both upper and lower sides, but the puddle itself was hard and dry. On the night of September 7 a measured quantity of water from the pond was placed in a square tea-tray, so that the level of the water inside the tray was the same as that of the water of the pond on which it floated. On the morning of the 8th, after a night of heavy dew, with a thick fog enveloping the downs till late in the morn­ing, the measured water had increased by three-hundredths of its volume. There had been no rain during the period of the experiment. 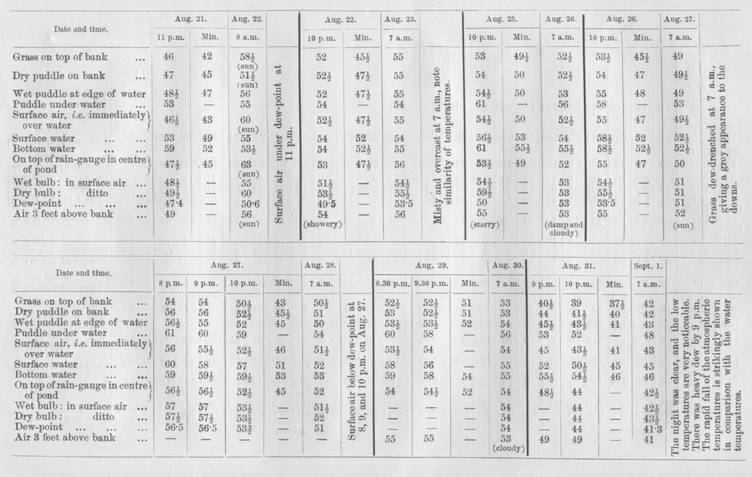 Two measured quantities of water, placed similarly at 9 a.m. on the morning of September 9, were found to have lost by 6 p.m. ten-hundredths and twelve-hundredths of their volume respectively. The day was cloudless and sunny, the difference between the two being probably due to the shade of some high-growing weeds, which may have hidden the direct rays of the sun from one of the pans during a portion of the day. It has been argued that the difference between evaporation and precipitation on the downs would be sufficient to account for the filling of the ponds by rain alone, on the ground that the rainfall on the downs is greater than in the valley below. My own experiments have not been made for a sufficiently long time to say that this is or is not the case. But during the period of my observation, there has not been a marked difference between them. 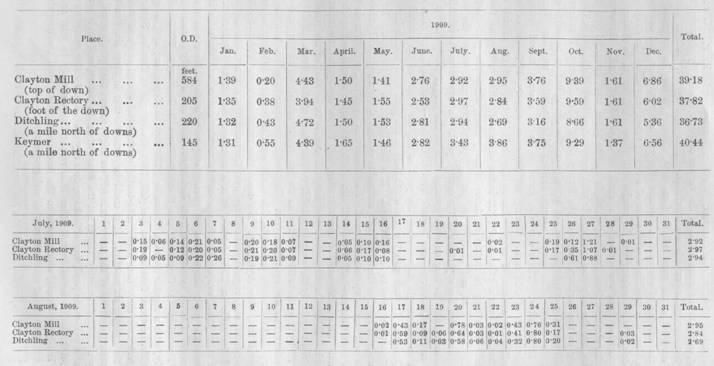 The table opposite shows the amount of rain for 1909 on Clayton Down, at Clayton Rectory, at the foot of the hill, at Keymer, and at Ditchling, the latter two villages being a mile from the foot of the downs. 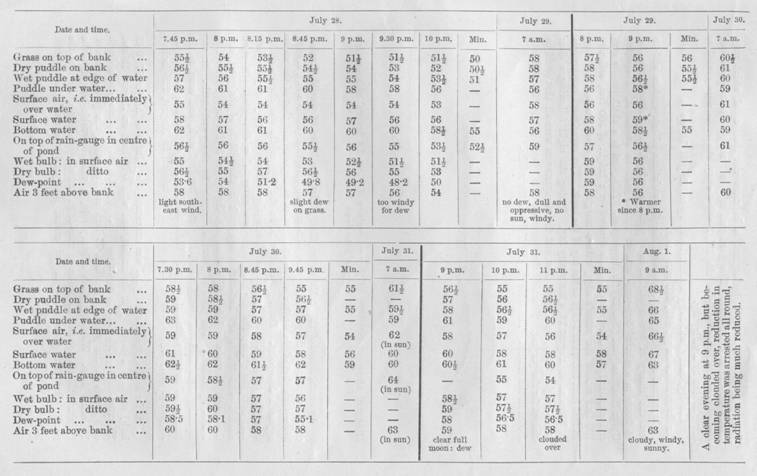 The totals for 1909 were respectively 39.18 inches, 37.82 inches, 40'44 inches, and 361'3 inches. The next table shows the rainfall day by day for two months, the totals being not markedly different. By the kindness of Dr. Hugh Robert Mill, I am able to reproduce a map showing the lines of average rainfall during the years 1868-1902, and this clearly demonstrates the fact that the higher the ground the greater is the average rainfall. in a tank of 4 feet internal diameter. We learn from a paper by Mr. P. R. Lowcock * that, owing to the construction of the various evaporators used by observers, many of the evaporation records are unreliable. That used by Mr. Latham seems to be accepted as the most reliable form used, although it may be suggested that, as the amount of evaporation depends chiefly on solar radiation and duration of sunshine, it is possible that the use of a copper vessel may affect the evaporation, especially when we compare the results with those which might be obtained from evaporation from the surface of a chalk or clay-puddled pond. However, the results obtained from Croydon, which, it may be added, have extended over thirty years, are the only ones comparable with evaporation from chalk downs, Croydon being on the northern verge of the Surrey chalk hills, although, I believe, the position of the evaporator was not actually on the chalk, but on tertiaries covering the chalk. The annual average amount of evaporation was here found to be 18.14 inches. There was also found to be an average annual amount of condensation of 0.36 inch. Taking the difference, namely, 17-78 inches, as the possible net amount of evaporation on the chalk downs, and the rainfall as 35 inches, we have a balance of 17.22 inches of rainfall which will go to feed the pond. This may be multiplied thrice in many cases, where the pond-margin is sufficiently hard and compact to prevent percolation, and where the margin contains twice the superficies of the central pond. In some cases the rainfall area has been found to bear an even greater ratio to the area of the pond. It must be confessed, however—and I speak from experience—that the lighter rains which fall on the margin do not reach the pond at all, the whole of the rainfall being soaked up. In such cases the rain which falls on the pond itself and its immediate margin alone goes to feed the pond. If a fine, light rain be continuous for some hours, this may, on the other hand, succeed in saturating the margin, and subsequent rain will run down into the pond. I estimate that even in the best made ponds not more than one-half of the total rain which falls on the margin ever reaches the pond. This is not easy of demonstration, but I give my opinion for what it is worth. In such a case, where the marginal area is twice that of the pond area, we must multiply the average rainfall twice instead of three times. Multiplying 17.22 by 2, we have 34.44 inches as the amount of rainfall which the pond would receive on an average in one year. Even with the draught which is made upon it by flocks of sheep and cattle, this would seem to be quite sufficient to prevent a pond from ever drying up. No doubt this satisfactory result would obtain if the rainfall were regularly distributed over the year. But it is not thus distributed, and the table for 1909 shows that it is most irregular in its distribution. 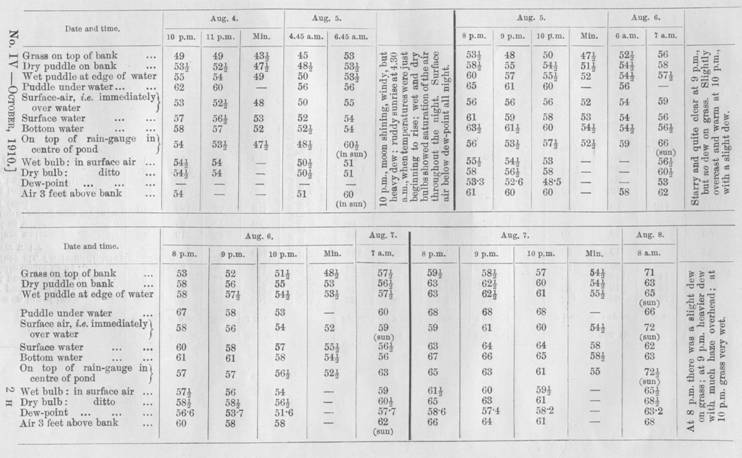 On the other hand, evaporation follows certain regular curves, and the table in Mr. Lowcock's paper shows that at twenty evaporator stations there was a steady increase of mean evaporation from January to July, and a steady decrease thence to December. At Croydon it rose from 0.246 inch in January to 3'305 inches in July, with a regular decrease thence to 0.233 inch in December ; and, as quoted by Mr. Lowcock from British Rainfall, 1901, the records at Camden Square and Atterbourne show that nearly nine-tenths of the total annual evaporation occurs in the summer six months. If it could be arranged that in these six months the greater proportion of the annual rain fell, we might expect that ponds would never dry up. Unfortunately, this is not the arrangement in nature, and yet it is rarely that a well-made pond, free of leakage, does dry up. And for this reason we must, I think, find a second recruit other than rain. This can only be mist and fog, or low-lying clouds, which come to the rescue, and make good the irregularities and inequalities of combined rainfall and evaporation. * " Evaporation from Water Surfaces," Association of Water Engineers. Some analyses of the water contained in certain of the ponds have been made by Mr. Wm. T. Burgess, F.I.O., and the results are given on p. 456. It will be useful to consider these together with those recorded in my former paper. 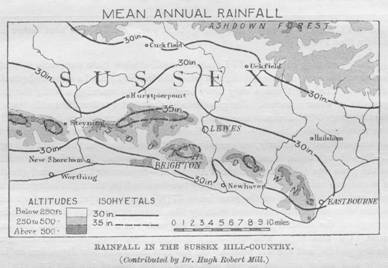 Mr. Burgess remarks that "the analyses, taking them on the whole, are what one might expect from rain and surface waters after storage in open ponds on the chalk hills. You will note that the lowest chlorine figure, 1.0, was from the pond farthest from the sea. The point which has most interest to me is the fact that several of the waters contained carbonate of soda. In some cases the amount was small, but in two—Lewes Racecourse and No. 21—the proportion was quite marked. As far as I know, this is a discovery." On June 6, after a good deal of rainy weather, it was particularly noticeable that the ponds numbered 1, 3, and 4 were remarkably low. Under the water of No. 1 pond large cracks could be seen, which showed that it had been dry probably for some weeks in April and May. Although raining heavily, no rain was running down the bank into the pond, the whole of the rain being lost into the puddle. This was true of all three ponds, and may demonstrate that they were leaking. After being cleaned out in September the water rose again, as shown in the description of these -ponds below. There was a terrific storm on the night of July 9, and the rainfall was sharp and sudden. No. 1 pond had been empty for some time. Previous minor rains had little effect on it, but short and heavy rain had given it water, which measured about 10 feet across. This goes to show that heavy rains run off into the pond with little percolation. Some details of the various ponds which I have had under observation are appended. No. 1. One Tree pond, overlooking Rag Bottom, 750 feet O.D. : Frequently dries up; very shallow trough ; fed by runnel from track during heavy rains. Circumference of water-edge on June 28, 1908, 75 feet ; on December 29, 1909, 104 feet, after heavy rains. The rain of the last three months of 1909 increased the areas of the various ponds enormously. This will be seen in the cases of other ponds as shown below. No. 3. Potamogeton pond, top of Burnt House Bostel, 730 feet O.D. : analysis made ; much weed and grass and ranunculus when first seen ; cleaned out in September, 1909. Circumference of water, 142½ feet on August 23, 1908; 6 feet to grass bank ; drainage from runnel only in heavy rains. Circumference on December 29, 1909, 165 feet, all the long grass in the pond being covered. No. 4. Grass pond, south-east from No. 3, overlooking Home Bottom, 716 feet O.D. : analysis made ; much grass in pond and reeds round edge when first seen ; grass almost to water's edge ; cleaned out September, 1909. Shingly soil ; no drainage from road except in heavy rains. A breeding-place for May-flies. The cleaning of this and No. 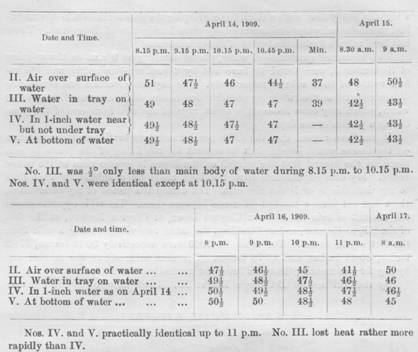 3 pond evidently stopped suspected leakage, and on December 29, 1909, the circumference ha& increased to 138 feet. No. 5. Ditchling Beacon, top of Ditchling Bostel and overlooking Big Bottom, 750 feet O.D. : Seaford Cliff seen in the south-east ; some tufts of reeds growing in pond, which would be good for dew ; many newts and limncea and planorbis snails ; a chalk-puddled pond. This pond is at the head of a long winding valley, and has not been known to run dry. At times of heavy raius there is probably much drainage from the chalky road. The water is very clear. Many dragon-flies ; some sludge in pond. On December 29, 1900, all the reeds were covered by the water, and the surface had encroached on the grass bank. The circumference was 245 feet. No. 6. High Park Corner, near, 620 feet O.D. : A large pond of very clear water ; chalk-puddled; water-edge marked by a ridge; no weed projects above surface ; on summit of down. Circumference of water, 227½ feet on August 12, 1908; 20 feet to grass bank. No. 7. Red-worm pond : A very foul clay-puddled pond ; mud permeated with errant red-worms ; much surface drainage from soil ; on side of hill ; many rushes in pond; puddled with red loamy clay. No. 8. Bushes pond : Clay-puddled ; water not clear ; fed by drainage from field, and dew from overhanging trees and bushes; near No. 7. No. 9. Waterhall valley, over, 400 feet O.D. : A beautiful pond, comparable with No. 6 ; water very clear ; little, if any, drainage from down ; weed beneath surface. Circumference of water, 260 feet; 15 feet to edge of grass ridge on September 13, 1908. No. 10. Oblong pond, 720 feet O.D. : puddled with white loamy chalk ; margin covered with angular flints ; the shape is unusual, the dimensions being 50 feet long, with an average breadth of 25 feet, on September 6, 1908; 147½ feet in circumference. A good deal of weed beneath the surface. No. 11. Circular pond, near to 10, 720 feet O.D,: very shallow ; much reduced in drought ; comparable with No. 1. Circumference, 140 feet on September 6,1908. Pond-weed under surface. No. 12. Cemented pond, on the Bulmer down, 390 feet O.D. : analysis made. No. 13. Chalky pond, near North bottom, on slope of hill, 570 feet O.D. : 1172 feet in circumference ; water very clear ; margin of smoothed white chalk. Not on summit of down ; analysis made. No. 14. Rottingdean, near Old Mill : dry many years ; covered with grass ; on highest ground of neighbourhood. An old stone-breaker stated that he had never known this pond to have contained water. He had served in the Baltic Fleet in Crimean days, and had settled in the neighbourhood soon afterwards. No. 15. Rottingdean, north-west of: dry, and overgrown with grass ; a clay­puddled pond. No. 16. Rottingdean, north-east of : a cemented pond ; circumference (July 8, 1909), 130 feet ; 13 feet across margin ; water foul; receiving drainage from farmyard. No. 17. Upper Standean, 560 feet O.D. : Water clean ; chalk-puddled ; analysis made. Circumference of water, August 14, 1809, 160 feet ; chalky margin, 16 feet across. On December 29, 1909, the circumference had increased to 206 feet, and the margin had decreased to 12½ feet across. No. 18. Ewebottom Hill pond, 450 feet O.D. : Circumference of water on July 14, 1909, 165 feet ; 20 feet across chalky bank ; hard puddle. Two well-defined ridges round pond at 5 feet and 9 feet from water's edge, showing limits of former extensions of the pond. A dry runnel on north-east side, but grass-grown ; quantity of pond-weed under surface, with eggs of fresh-water snails. On December 29, 1909, the circumference had increased to 201½ feet. Analysis made. No. 19. South Hill, Pangdean, 550 feet O.D. : Dry ; concreted, but concrete broken up. Concrete made of fine gravel and occasional shell-fragments, about ¾ inch thick. 20. Over Donkey Bottom, Standean, 400 feet O.D. : dry ; a well-made pond, on side of hill. No. 21. Piddingworth, 580 feet O.D. : Analysis made ; water green with algm ; water not clean, very green ; much used by cattle. Circumference of water, 170 feet on August 8, 1909; 15 feet across white-puddle margin. Analysis made. No. 22. Greystones pond, 620 feet O.D : Analysis made ; circumference of water on August 1, 1909, 95 feet ; weeds almost to water's edge ; large crater-like trough ; surrounded by large masses of Tertiary sandstones (sarsens) * ; much pond‑weed and grass in water. Circumference on December 29, 1909, 122½ feet ; water's edge to rise of bank, 22½ feet. No. 23. Plumpton plain, 680 feet : Dry ; overgrown with grass. Nos. 24-26. On Bulmer Huff, 500 to 530 feet O.D. : All dry and overgrown. No. 29. Shambledean Bottom, 350 feet O.D. : Analysis made; circumference, 77½ feet on August 22, 1909 ; 15 feet across margin ; much drainage. No. 30. Stanmer Down, 430 feet O.D. : No runnels ; analysis taken ; 114 feet in circumference on September 4, 1909; 20 feet across margin. This is a carefully concreted pond, apparently kept watertight by constant repairs ; on the summit of the down. No. 31. High Park Wood : pond dry September 7, 1909; 500 feet 0.D. ; 63 feet bank to bank. In centre of pond is a perforated pipe projecting about 1 foot, from which the water collected is made to flow to a farm lower down. No. 32. Pyecombe Golf Links : pond dry September 8, 1909. Next to rain as the chief means by which the ponds are filled we may safely place mist and fog, especially as regards those ponds which are at the very summit of the hills, where the condensation resulting from altitude is greatest. We have seen that the quantity of sodium chloride in the ponds is large. I think much of this may be attributable to its precipitation therein as the nuclei of mist-particles. In the early morning I have seen the mist gradually forming, not only in the valleys, but on the hills. Not always do they creep up the valleys from the sea, as has been alleged. If that were the case, I am afraid many of them would disappear in the rising sun before they reached the escarpment. Charged as the atmosphere always is with particles of common salt and other salts, the chills of early morning requisition these particles as the carriers of condensed aqueous vapour, by reason of their affinity for moisture, and when the mist is on the move, as it almost always is, much of the mist and salt-particles is mechanically deposited by gravitation in the ponds as the mist passes over. It is an interesting subject for discussion as to whether the electrical condition of the atmosphere has anything to do with the deposition of aqueous vapour on the surface of ponds. It is now thought that the air is charged with electrons ejected from the sun, the negative corpuscles being drawn, as suggested by Sir Oliver Lodge, towards the poles by the Earth's magnetic field, leaving the Earth positively electrified, and as the vapour rises out of the soil after nightfall with radiant heat, it conveys with it a charge of positive corpuscles. Can it be that this electrical condition of the atmosphere contributes to the filling of the ponds? Fog is usually in a high state of electric tension. Every fog-particle is charged, and, in accordance with the well-known law the electrical tension is greatest on the surface of each particle. The immediate surface of the Earth over which it floats becomes electrified in an opposite sense, and as the tension increases there is the tendency for the fog-particles to be discharged. As the union of rain-drops in a cloud into larger drops preparatory to their falling results in greater electrical potential on the larger drops, and this accumulates until a flash of lightning relieves the tension and the rain falls, may there not be a similar action taking place in the mist-particles ? The dense fogs of the Downs are caused apparently by the fact that (1) the dust nuclei are comparatively few on these heights, and (2) a large proportion of these are salt particles. On account of each of these circumstances the particles become gorged, so to speak, with vapour, and drench clothing and vegetation with moisture. The particles are heavily laden, and roll into any and every depression, or, if arrested by a clump of trees, will deposit their moisture thereon or thereabouts. The fall of rain from a cloud is a consequence of electric discharge. The fall of fog-particles is in the same way the consequence of the discharge of their electricity, but the particles, being portions of a cloud in contact with the earth or pond, would discharge gradually and with­out any sudden and visible discharge, such as would take place in the case of an electrified cloud. * Nature, April 5, 1900. The downland heights are rounded and free from angular protuberances such as would tend to dissipate the electrical discharge into space, and they would seize upon a fog or mist as means of carrying off their positive charge. Given a period of fine weather, free from fog, and there is no means of escape of the electrical potential of downland except in the relief afforded by a thunderstorm. Dr. John Aitken has pointed out that dust-particles will form nuclei when the atmosphere is saturated, or even when the air is not quite saturated, whereas ions, whether negative or positive, require a degree of supersaturation before they can act as nuclei. In order to obtain a supersaturated atmosphere it is necessary that we should have a dust-free atmosphere, and if there is not such a thing as a dust-free air to be found, then there can be no such thing as the supersaturated air requisite to bring about the separation of positive and negative ions. Dr. Aitken states that "it can hardly be said that there is such a thing as dust-free air." Mr. C. T. R. Wilson, however, maintains the theory that the well-known positive electrification of the atmosphere is due to the superiority in efficiency as nuclei for the condensation of water vapour of the negative ions over the positive, thus causing the precipitation of the negative ions. It has been pointed out by Prof. J. J. Thomson that if positively and negatively charged ions respectively require different degrees of supersaturation to make them act as nuclei for the condensation of water-vapour, this may be a source of atmospheric electricity. Mr. Wilson has proved by experiments that he has made that water-vapour does condense much more readily on negative than on positive ions, and sufficient evidence has been brought forward to prove the existence in the atmosphere of free ions. He thinks that the necessary degree of super-saturation can actually occur in an elevated dust-free layer, and thus the positively electrified normal condition of the atmosphere is the result. 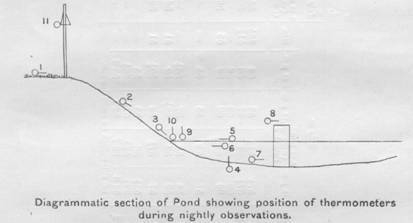 Mr. A. Marshall endeavoured in 1900 § to explain the precipitation of fog-particles into dew-ponds by a difference in potential between the particles of moisture and the hill-summits on which the ponds are situated. He thought that owing to this difference of potential the particles would be attracted to earth, and presumably also to a pond. His experiments were not, however, performed over water, and I think that the normally positive condition of fog is sufficient, by induction, to justify a belief that its particles will be naturally drawn to earth and finally discharged there, and, seeing that it is always more or less on the move, every pond that it meets will benefit. * Quoted by John Perry in Nature, March 25, 1900.
t Nature, March 1, 1900. Ibid., March 29, 1900. § Ibid., September 20, 1900. In conclusion, I have again to express my indebtedness to the Royal Society for a Government grant which enabled me to pursue my investigations into this fascinating subject. I commenced my observations on this subject with a leaning towards the theory that many downland ponds were dew-ponds ; that is, that they were replenished principally from dew. I confess I should have wished to have been able to prove to you that dew was an important factor in filling the ponds. But I have been led to believe otherwise, and I retract anything which I have said in this direction as having been founded on insufficient data. Very rarely, indeed, does dew ever form on the surface of ponds, and rarely, I believe, on the puddled margins; and if we continue to use the term dew-pond, we must remember that the word must be used here in the widest sense as including any form of condensation out of the atmosphere. Rain is undoubtedly the all-important replenisher of these, as of all ponds which are not fed by springs. It is almost with a feeling of regret that I abandon the theory of dew-filled ponds. The mystery surrounding the quiet invisible formation of dew has a fascination for me, as for most people, but the results of greater knowledge must prevail, and the dew which waters our downland grass and the corn on our dry flint-bestrewed downland fields cannot longer be held to have any important bearing on the " mystery," which is no longer a mystery, "of the dew-pond." Dr. STRAHAN : We have to congratulate Mr. Martin on having brought to a conclusion—a temporary conclusion only, I hope—an investigation on which he has been engaged for a couple of years. He has done a great deal of work, some of which must have involved no little hardship in the performance. Whether we shall all agree with the conclusions at which he has arrived, I would not venture to say, nor how much work remains to be done, but I invite discussion in the hope that both these considerations will be taken into account. Mr. W. T. BURGESS : I think I have very little to add to what Mr. Martin has quoted from the letter I wrote to him, concerning the water analyses I made to assist him in his investigation. The extraordinary thing was the presence of carbonate of soda in some of the samples. Carbonate of soda is found in well waters, obtained from the Chalk beneath the London Clay, and also from some other calcareous formations covered with impermeable strata. I refer those who are interested in alkaline waters to the papers of W. W. Fisher, in the Analyst for 1901 and 1902. The carbonate of soda found in the pond waters was, in all probability, formed by the slow reaction of carbonate of lime, with the silicates containing alkalies, which were present in the soil and mud accumulating in the beds of the ponds. It is perhaps worth noting that I recently found a small but distinct quantity of carbonate of soda in a sample of water taken from a chalk percolation gauge, the sample representing the first water that had passed after a long period of no percolation. is something like three times the amount it would get without margin, instead of twice. I raise the point because it seems to have a considerable bearing upon the final conclusion. If the author's conclusion is that rain is sufficiently important to explain the ponds, it must be of even more importance than he gives it credit for, and so strengthens his conclusion. Captain T. H. TIZARD : I would like to suggest one point with reference to these conclusions, a quite simple one, namely, the reason there is more dew on the land than there is over the pond. In the one case the radiation from the earth, being considerable, causes a low temperature which collects the moisture from the warmer atmosphere, whereas the radiation from the pond, whilst it cools the water on the top of the pond, causes the colder water to sink to the bottom, and the warmer and lighter water to rise ; therefore the surface water is never as cold as the surface land is. The radiation from the surface of the pond is nothing like the radiation from the earth, therefore the air that is in contact with the water of the pond does not deposit the dew on it. I do not know whether that has been explained before, or anything else about it, but it struck me as a point that might be brought forward. Major DARWIN: I understood that the measurement of the rise of the water when the fog fell on the pond was done by watching the rise on the stick. I should like to know what Mr. Martin thinks of the possibility of adopting a more accurate method of estimating the height of the water. The best plan would be, I suggest, a screw touching the surface of the water, a method by means of which extremely accurate measurement can be obtained. Captain WILSON BARKER : I should like to join in the thanks to Mr. Martin for his interesting paper on "Dew Ponds." In some districts such ponds would be very useful. The formation or maintenance of these ponds seems to be controlled a good deal by the formation of the soil, and it appears as if they were formed only on the Chalk. I share Mr. Martin's disappointment in his conclusions that these ponds may not after all be " dew " or "mist" (as I should prefer to call them) deposits, but are kept going by rain. I hope that further investigation may be undertaken, as I do not think it is even yet settled. I think, perhaps, valuable assistance might be obtained from practical agriculturalists. Meanwhile, we owe Mr. Martin our hearty thanks for his painstaking labours and his most interesting series of papers. Mr. S. SKINNER : I should like to congratulate Mr. Martin on the scientific spirit with which he has carried on his experiments, although it must have been somewhat hard to have to come to the result that he has ; but it is a result which 1 have been forced to accept for a long time, namely, that it is rain which fills these ponds. I was very much interested this year, when walking about on the Southern Downs, to find that casual labourers and field men I asked how the water got in the ponds invariably told me that it was rain. I also met with the same answer in another part of England. But still I have felt that there is an opening for some one with sufficient perseverance to actually separate the amount of dew which forms from the rain and mist which falls. I think there is an opening to measure this, and last year some little step was made towards this. I have adopted a vessel which is eminently suited for dew formation; that is to say, I have taken one of Sir James Dewar's vacuum vessels—vessels with a double wall, in the form of a champagne-glass, which many of you may have seen at the Royal Institution used to hold liquid air, and which have the remarkable property of very small heat transmission. This makes it an excellent vessel to form such a pond, and taking such a vessel and enclosing it suitably in a box with an open top, a friend of mine was kind enough to make observations in August and September on every dewy night, and he estimated the amount of dew in the same way as you estimate rain, that is, the number of inches on the area of the ground, as carefully as he could, and then made the assumption that the experiment was conducted for a whole year. It is, of course, an assumption, because there are months in which there is practically no dew. Doing this, we found that the amount for the whole of the year does not amount to an inch ; that is to say, using the best conditions for the formation of dew, we did not get more than an inch of water. Of course, that is nothing com­pared with the rainfall. I hope shortly to put those figures together and to publish them. Coming to the question of mist, which is the next source which Mr. Martin has discussed, I should like to remark that I do not think you can get much water collected out of mist through its simply falling by the action of gravity, for the velocity of fall of mist particles is very small. I think that the chief way in which mist particles are collected is simply by direct entanglement. If a mist blows against a body, the particles are thrown against it, and caught by direct entanglement, s) that I would not look to falling by gravity as the agent for filling a pond from mist. As to the electric phenomena to which Mr. Martin has alluded I really feel there we have much to learn. One thing I think we can at once take warning about is, that we must be very careful to distinguish the new electric views from the old ones, and I did not think Mr. Martin had done so. I hardly like to go into that matter without taking the paper and going through it very carefully, but I do not feel that there is much hops of bringing the fog particles on to the pond through just an ordinary electric attraction which was alluded to. I should like to repeat my congratulations to Mr. Martin, and to say how much I admire the scientific spirit with which he has given up a view which he favoured, for the one which I think must now be adopted. Dr. WILLIAM MARTIN : I can scarcely hope to add anything which is of utility to this long series of observations which have been made by Mr. Martin during the last and previous years. Reference has already been made to his extreme industry. He has not mentioned it himself, but I think I ought to allude to the fact that on one day he erected a tent in order that he might be present and lie awake the whole of the night to take hourly and half-hourly observations. We are not here this afternoon to discuss the formation of these ponds, but I could not help remarking, as I saw those slides which were shown us, of the care that was taken by the local agriculturist to preserve a clean edge on the margin of the ponds. In every pond with which I am acquainted that was holding water, the edge of the margin had been carefully cleaned in recent years. Evidently in the minds of the people on the spot, the extent and cleanliness of the margin had a great deal to do with the amount of water that the pond would hold. As regards the cattle passing through a pond and spoiling the straw, as I understood a previous speaker to remark, that, of course, entirely depends upon the question whether there is any straw there or not to spoil. I have had many conversations as regards the question of straw with a good many people on the South Downs, and none of those to whom I happened to speak had used straw, or had heard of its employment. I think one of the most important results that is to be obtained from this paper is set out upon page 444, where we find : "during the hours of possible dewfall the temperature of the surface air was, with but one exception, always lower than that of the surface water, and on no occasion did that of the water approach dew-point." That should give the death-knell to the theory that, the water in the pond being colder than the air, the temperature of the layer of air in contact with the water is diminished, and the air thus caused to deposit its moisture as dew, and so enrich the total quantity of water in the pond. One great advantage of a paper like this is that it should put an end to arm­chair theorizing upon natural phenomena. There has been far too much of that, especially in connection with dew-ponds. I feel sure that if anybody now comes forward to discuss any theory that he may have as to dew-ponds, he must either have repeated this laborious work of Mr. Martin, or he must have digested the tables which are here so well set out. It is a feature of the paper that Mr. Martin has not hesitated to put down the results of his observations, so that other people may see the basis of his conclusions and agree or disagree with him as the case may be. Allusion was also made to the idea that Mr. Martin should continue his experiments upon this enticing subject. I feel quite sure Mr. Martin would do so on one condition, and it is a pecuniary condition. All these experiments and observations take up not only a large amount of time, but, considerable expense is also attaching to them, and that expense must be met out of somebody's pocket. In this case it was due to a Government grant through the Royal Society. Dr. STRAHAN : Unless any one else wishes to make any remarks, it merely remains for me to read some questions which Dr. Herbertson has left behind with me, with an apology that he was himself obliged to leave. He asks, " Was there dew on any inorganic matter? How far is ' dew ' on plants due to transpired water from the inside of the plants, and how far to deposition of atmospheric moisture? Were the dry and wet bulbs ventilated ? In calm weather the ordinary wet bulb is of hardly any use—it must have air drawn past it or be swung through the air." For my own part, it seems almost ungracious to ask one who has done so much if he cannot do a little more, but it seems as if there was room for further precise observations on the fluctuations in the water-level. There are forms of apparatus which will enable exceedingly minute variations to be detected. Observations of that description, accompanied by simultaneous notes on the character of the weather, might be taken during bright and cloudy summer days, during clear and misty nights, and under various climatic conditions. It would be most important to determine what fluctuations, if any, were shown under those varying circumstances. A few years ago, the existence of trees hanging over dew-ponds was insisted upon by several writers on the subject as a sine qua non, and there can be no doubt that, under certain circumstances, this must help in collecting water ; the fug, as it is blown past, settles upon the branches to such an extent that, although there may be no rain falling, the effect of a heavy rain is produced. I do not know that any mention of that matter appears in the paper. I will now ask Mr. Martin to reply to the various questions which have been raised in the discussion. Mr. E. A. MARTIN : I am very much obliged to you for the way in which you have received my paper. There is a great deal of work yet to be done, and what I do want to do in the future is something in the nature of those precise experiments as to variations in the surface-level of the water. I should like to say, however, that I did not measure the evaporation or condensation in those few experiments that I made merely by measuring the rise and fall of the water on the stick, but by means of measured quantities of water in little square trays, as mentioned in the paper. I should like to say at once that a number of the points which have been touched on this afternoon I dealt with last year, and for the sake of brevity I did not repeat them. One point mentioned was the question of puddling by cattle. I particularly dealt with that last year, and gave particulars of some evidence I obtained from the Downs. Mr. Bennett suggested some years ago that puddling by accident may have been the origin of the idea of the sheep-ponds; that is to say, for instance, on the top of Cissbury there is a good ditch all round the greater part of the camp. Water would fall therein, and cattle would puddle it when they went through the openings in the vallum, and in a very short time there would be natural puddling which might give rise to a pond there. That may be a natural cause, in the first place, of the idea of a pond having a puddled bottom ; but of course that is only theory. Another matter referred to is that the deposition of dew on grass is more than that which falls on the water. I think I have dealt with that ; I am strongly of opinion that such is the case, particularly from the fact that so seldom does the water become reduced in temperature to dew-point or below. The formation of dew on the grass is quite a different matter to the formation of dew on water. Grass may be wringing wet, as it frequently is on the downs, and yet the water is comparatively warm. In regard to Mr. Skinner's remarks with reference to his own experiments, I sincerely hope that we shall see the result of the observations that have been made. One gentleman referred to an incident that, when he asked of certain men as to how the water got on the Downs, they said of course it was rain. Well, you have got to have an impervious bottom to your ponds before you can hold the water that does arrive there. With regard to the foundations of such ponds, I do not want to say that a dew-pond could not be made, although I think these ponds that we have seen are not dew-ponds; all I say is that farmers with the means at their disposal will not be disposed to spend very great sums of money to make them really dew-ponds when they can get mist- or rain-ponds. But I have not the slightest doubt that you can induce a precipitation of dew by keeping the water cold. I do not know why you should not have such an arrangement as one finds in a thermos flask—then possibly you might have a proper dew-pond. But farmers are not going to this expense when by ordinary means they can get ponds which are satisfactory from their point of view. I think I have taken up most of the points that need be answered. I have noted other points which I shall certainly take up in the future when I have an opportunity. As Dr. Martin said, it is a question of expense, and I was considerably helped by the grant with which the Royal Society kindly furnished me. Copyright © 2002-6 Martin Snow and contributors as noted. All rights reserved.